Are you a moral person? - Website of reckersworld! I hope that you, reading this, are a good person, one who considers themselves caring, considerate of others and a down right decent and moral human being. But to find out, how about you put yourself in the shoes of Pat. Pat is a God fearing Christian; a loving family man who cares deeply for those around him. He tries to live a Godly life while avoiding the temptations that the devil puts in front of him. He meets up for a coffee with Dan one day and figures it’s time to talk to him about God. After all, without God in his life, how can he possibly deal with the traps of the devil? Dear reader, it’s now time to ask yourself…. How moral are you? Would you knowingly conceive an abomination like the devil? If you say yes, then you are truly a despicable person, even worse than the devil himself, because the only thing worse than being something abominable is CREATING that abominable thing. Or would you refuse to create that abomination like any caring or moral being would? 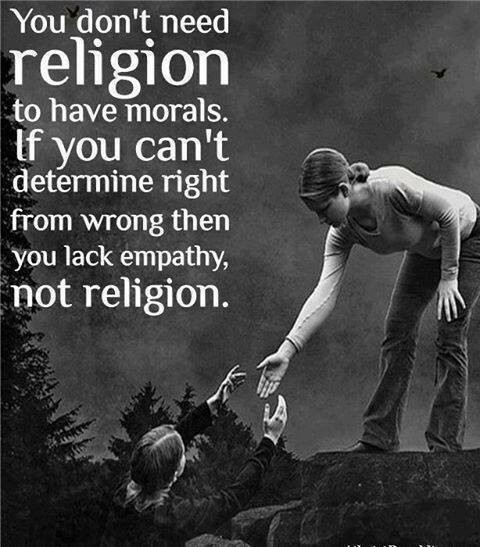 Thus showing you are in fact more caring, loving and moral than the God of the bible? Or are you, like me just thankful that this so-called God (and his abominable creation) doesn’t exist and that you can be a moral person without the need for any God? An all knowing God would know what it takes to give a people with free will eternal life. First he would have to teach us to stop sinning and destroying ourselves. How would you do that? I don't see how that question is relevant.